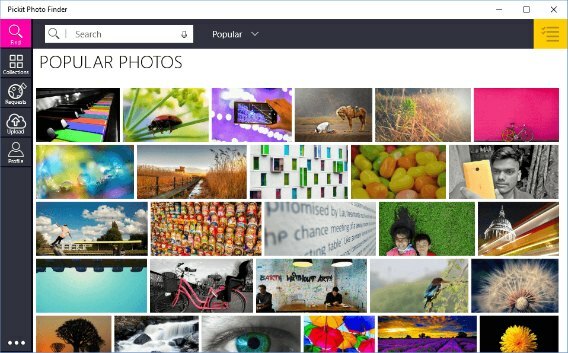 Pickit Photo Finder is a free app for Windows 10 devices that offers royalty free images across a wide array of categories that make create PowerPoint presentations, blog posts, or project more easily. Pickit Photo Finder app is now universal and available for Windows 10 PC and Windows 10 Mobile devices. The photos on Pickit are listed from Pickit Market and submitted by photographers registered that allows users get access to all the images for free. Interested users can sign up account with email address and password. Once sign in to the app, user can downloaded images for free into device. It lets user access all the photos in Pickit’s library, if user don’t find a photo that need, user can request image from the photographer community that matches their requirements. Paid version of Pickit Photo Finder app also available with costs $9.99 a month which lets user submit image requests and download full-size images.